President of FC Shakhtar Donetsk Rinat Akhmetov has summed up the results of the 2017-2018 season, which he called one of the best in the club's history. "The successful season involves bright victories and trophies, that's a spectacular performance, the respect and applause of the fans. I consider the 2017/18 season to be one of the best in the history of Shakhtar. The team has won the league title and the Ukrainian Cup for the second time in a row, claiming the second consecutive golden double and adding the Super Cup title to it. Three trophies in one year – that's certainly an excellent result," reads his address published in the club's report for the 2017-2018 season. 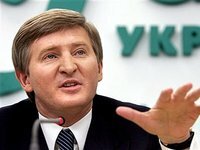 Akhmetov stressed that Shakhtar showcased some strong European football in both the league and the Champions League. "Manchester City, Napoli and Feyenoord - everyone said that we got the group of death. But we won four games against those teams and had two worthy Last 16 encounters with Roma. With their performance, the team has earned a great respect and recognition," he said. Akhmetov said he was convinced that the team has a huge potential and that every year Shakhtar just gets stronger. "We have strong players, a strong coach and the best fans in the world. I am sure we will continue displaying spectacular football, we will continue winning and holding trophies in our hands. The club ambitions are unchanged: gold medals, the Champions League and the applause of our fans," he said.